Ian Parry was a talented photojournalist at the beginning of his career, when he was tragically killed whilst on assignment for The Sunday Times in December 1989. 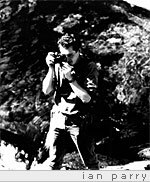 As the youngest of four children from Prestatyn, north Wales, Ian was determined from an early age to pursue a serious career in newspaper photojournalism and joined the local Rhyl Journal as a trainee at the age of 16. After studying on Sheffield's NCTJ course, he moved to London to secure his dream and joined The Sunday Times as a staff photographer. On one of his first major assignment to cover the war in Romania, a job he was determined to undertake, the plane carrying him home crashed just after take off in bad weather. "He was one of the finest young photographers to have entered Fleet Street in recent years. He had a great deal of personal discipline, which he combined with flair, imagination and tremendous compassion", said Aidan Sullivan, who set up The Ian Parry Scholarship in his memory. Tributes to Ian have come from every picture editor he worked for. "He could turn his hand to anything and had great potential. We often sent him on long, difficult jobs and there was never a squeak of complaint," said Michael Young of The Times. The Ian Parry Scholarship was created by his friends and family in order to build something positive from such a tragic death. Each year we hold an international photographic competition for young photographers who are either attending a full-time photographic course or are under 24. Entrants must submit examples of their work from their portfolio and a brief synopsis of a project they would undertake if they won. The prize consists of £3000 towards their chosen assignment £500 to those awarded Highly Commended and Commended. In addition to this, the World Press Photo automatically accepts the winner onto its final list of nominees for the Joop Swart Masterclass in Amsterdam. This is a significant prize for any photographer and continued with the support of the Sunday Times Magazine, which publishes all the finalist¡¯s work; the scholarship provides an excellent launch into a professional career in photography. Year after year, the award has highlighted the work of some of the industry¡¯s finest emerging talent, all of whom have progressed into professional careers and still support the award. Once again, our extremely popular and well-attended print exhibition will take place at the Getty Images Gallery in London from August 7th for two weeks showing all of the winning entries as well as an edited selection of images chosen by the judges. Our sponsors are The Sunday Times, Getty Images and Canon and our sincere thanks to the Frontline Club www.frontlineclub.co.uk, Athene Design and British Journal of Photography. There are now three versions of the replica watches Universal Pilots Timing, the regular version, the Little Prince, and the Navy's Air Combat Corps. Like the Mark 18, the regular version is replica watches sale covered with an airplane at the base; the Little Prince version is a carved little one at the bottom. It should be noted that the naval air combat force version of the fleet of naval air replica watches uk combat mission shell version is not a universal movement, using the universal self-made 89361 fly back chronograph movement, is a high-end chronograph movement, coupled with ceramic Shell, so the replica rolex price is expensive, please pay attention to distinguish.